Canopus, Alpha Carinae, is the brightest star in Carina constellation and the second brightest star in the night sky. Canopus is fainter only than Sirius. The star is a supergiant or bright giant, yellowish-white in colour, with an apparent magnitude of -0.72. It is located at a distance of 310 light years from Earth. It lies too far south and can’t be seen north of latitude 37°18’N, but it is circumpolar for observers south of latitude 37°18’S. For northern observers, Canopus doesn’t rise very high in the sky. The name Canopus comes from the Greek name Κάνωβος (Kanôbos), first recorded in Ptolemy’s Almagest (150 AD). Canopus’ distance from Earth was uncertain until the 1990s, when the European Space Agency launched the Hipparcos satellite. This was partly because the star has an unusual nature, one not yet fully understood by astronomers. Canopus has the stellar classification F0 II or F0 Ib. The Ib classification means that the star is a less luminous supergiant. It may be evolving into a red giant or away from red giant status. Canopus is quite large in size, with a diameter 71.4 times that of the Sun. Placed in the centre of the solar system, the star’s surface would extend to about 90 percent of the distance from the Sun to Mercury. The star itself would have an apparent magnitude of -37, compared to the Sun’s -27.5. Canopus will likely end its life by expelling its mass to form a planetary nebula, leaving behind a white dwarf. It is not large enough to explode as a supernova. The star has an estimated surface temperature of 7,350 K, making it significantly hotter than the Sun. For southern hemisphere observers, Canopus and Sirius reach the meridian only 21 minutes apart and can be seen in the sky at the same time. 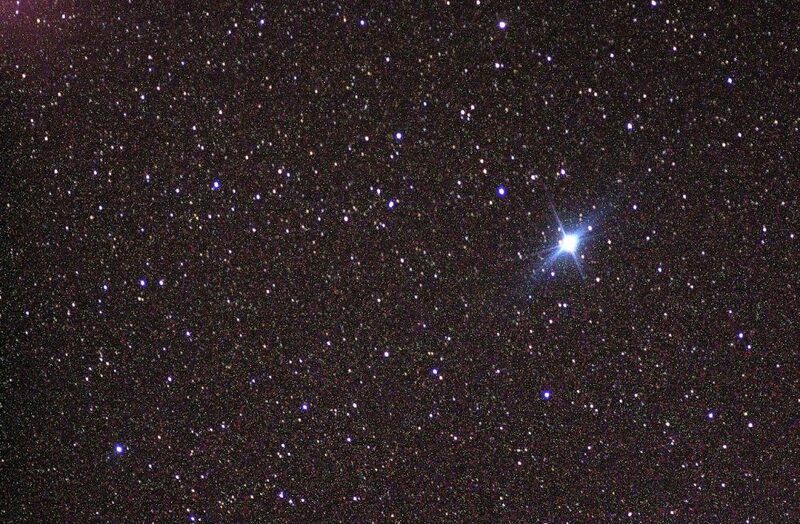 With an absolute magnitude of -5.53 and 15,100 solar luminosities, Canopus is the most intrinsically bright star within 700 light years from the solar system, far brighter than Sirius, which is much closer to us (8.6 light years) and appears twice as bright as Canopus. Canopus culminates at 9 pm on February 11 and at midnight on December 27. Canopus can’t be seen from most locations in Europe and North America. Observers in northern latitudes south of 37°N can find the star below Sirius in the southern sky on winter evenings. Canopus is at its highest in February around 9 pm. It is located about 36 degrees to the south of Sirius. Southern hemisphere observers can see Sirius and Canopus – the two brightest stars in the sky – high overhead, crossing the sky together. While the etymology of the name Canopus is known, the origin itself is uncertain. One theory suggests that the star was named after Canopus, the pilot of the ship on which Menelaus sailed to retrieve Helen of Troy after she was kidnapped by Paris. When Menelaus’ ship arrived to Egypt in 1183 BC after the destruction of Troy, Canopus was bitten by a snake and died. To honour him, Menelaus founded a port there and named it Canopus, and also gave the name to the bright star that rose when he was giving the dedicatory speech. The ancient port is now in ruins, but the village of Al Bekur (Aboukir), which occupies its site, is known in history as the site of Lord Nelson’s Battle of the Nile (1798). Another theory suggests that the name is derived from the Egyptian Kahi Nub, meaning “Golden Earth.” In ancient Egypt, the star would have appeared near the horizon, which means that it would have looked reddish to observers because they would be looking at it through a thicker layer of the atmosphere. The same thing happens when the Sun and the Moon appear low in the sky. Another association that may explain the origin of the star’s name is the Arabic word janūb, meaning “south.” The southeastern wall of the Muslim Ka’bah, named Janūb, points in the star’s direction. Canopus is a member of the Scorpius-Centaurus Association, the nearest OB association to the solar system. Other members include Antares, most of the stars that form the Southern Cross, and a number of bright stars in the constellations Centaurus, Crux, Lupus, and Scorpius. Canopus is moving through the Milky Way Galaxy at a speed of 24.5 km/s relative to the Sun. The star’s projected galactic orbit takes it between 21,300 and 24,300 light years from the galaxy’s centre. Alpha Carinae made its closest approach to the Sun 3.1 million years ago, when it came within 172 light years, brightening to magitude -1.88. As a result of precession, Canopus will be taken within 10 degrees of the south celestial pole around the year 114,000 AD. Canopus is a strong source of X-rays, which are likely produced by the star’s corona. The corona is magnetically heated to approximately 15 million K. For comparison, the Sun’s corona, which can be seen during solar eclipses, has a temperature of 2 million K.
Canopus is used in space navigation to adjust the position of spacecraft in space. Many spacecraft are equipped with a special camera called the Canopus Star Tracker. English explorer Robert Hues brought Canopus to the attention of European observers. He wrote about Canopus in his work Tractatus de Globis (1592). He also mentioned the bright southern stars Alpha Centauri in Centaurus and Achernar, Alpha Eridani, in Eridanus constellation. 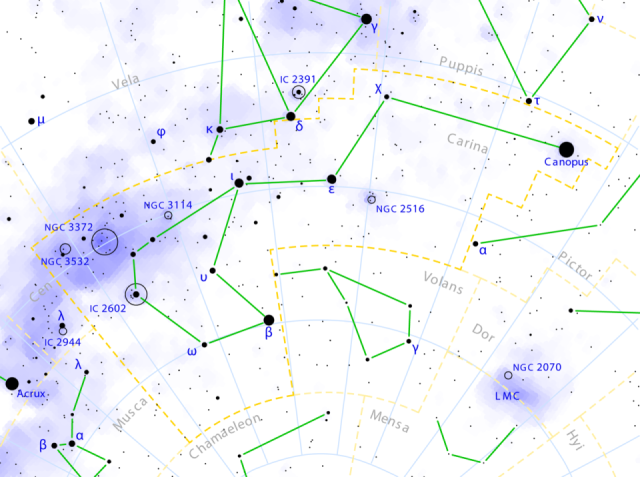 Ancient Greeks and Romans could not see Canopus. However, the constellation Carina was once part of a larger constellation, the Argo Navis, which represented the ship of Jason and the Argonauts, with Canopus marking the ship’s rudder or keel. 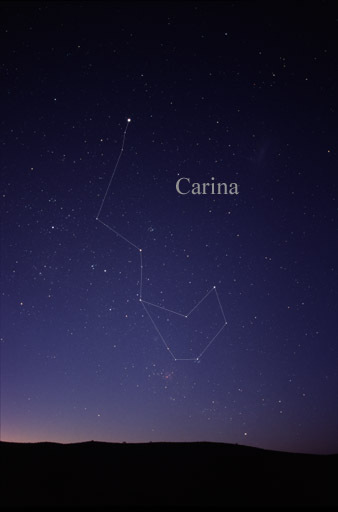 Canopus was the Alpha star of Argo Navis, which was later divided into three smaller constellations: Carina (the Keel), Puppis (the Stern), and Vela (the Sails). Ancient Mesopotamians knew Canopus as NUN-ki. The star represented the city of Eridu in Babylonian star catalogues. 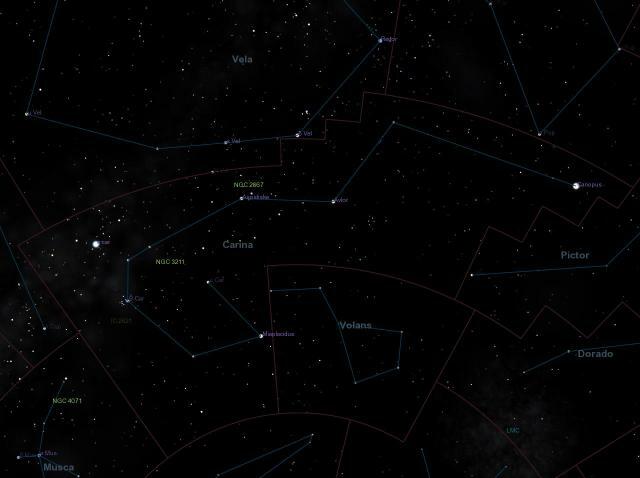 Today, the star commonly known as Nunki is Sigma Sagittarii in Sagittarius constellation. 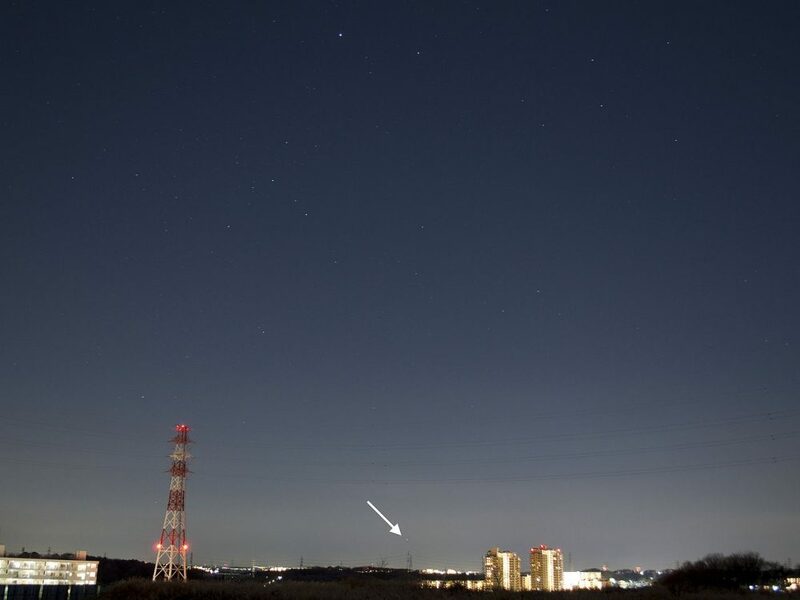 In Japan, Canopus is known as Mera-boshi and Roujin-sei, or the Old Man Star. The Chinese know Canopus as Lǎorénxīng, meaning the Star of the Old Man or the Star of Old Age. 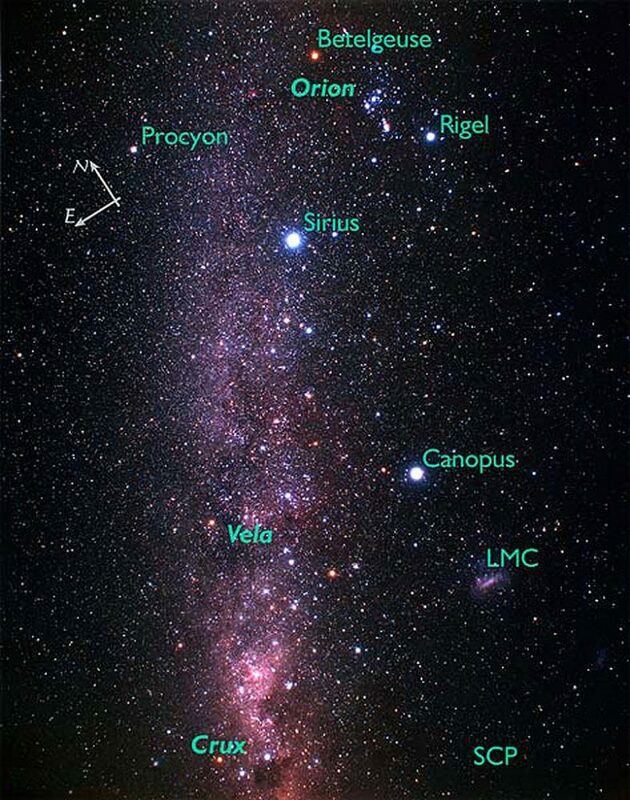 Canopus is invisible from China, but Chinese astronomer Yi Xing had travelled south to chart the southern stars in 724 AD and he mapped Canopus among other bright stars. The Chinese had likely known about the star from earlier times. The star’s Arabic name, Suhayl (or Suhail) was given to it by Islamic scientists in the 7th century AD. The name Suhayl was also used by the Bedouin people of the Negev and Sinai. Canopus and Polaris were the two main stars they used for navigation. In Indian literature, Canopus was associated with Agastya, one of the ancient sages or rishis, known as the “cleanser of waters.” Other rishis are associated with the brightest stars of Ursa Major. In Botswana, the star was known as Naka, appearing late in the winter sky, heralding stronger winds. The Bushmen in South Africa knew Canopus and Sirius as the stars that signalled the appearance of flying ants. Ancient Polynesians used Canopus for navigation. The star marked the southern wingtip of a constellation they knew as the Great Bird or Manu, which divided their sky into two hemispheres. Sirius marked the bird’s body and Procyon the northern wingtip. The Kalapalo people in Brazil knew Canopus as one of the bright stars forming the celestial Duck. 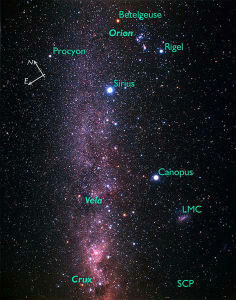 Procyon, Castor and Pollux were the other stars forming the asterism. An old Middle Persian book of animal fables, Kalīla o Damna, was later known as The Lights of Canopus, or Anvar-i-Suhayli. Together with Achernar in Eridanus and Fomalhaut in Piscis Austrinus, Canopus made up the Tre Facelle symbolizing Faith, Hope and Charity in Dante’s Purgatorio. Canopus has often been used in modern literature, too, including the series Canopus in Argos by Nobel Prize winning author Doris Lessing and Frank Herbert’s Dune (1965) and other novels in the Dune series, in which the fictional planet Arrakis is the third planet orbiting the star. In 2010, a plain on Titan, a moon of Saturn, was named Arrakis Planitia, after the planet in Dune. Other novels that mention the star include Edmond Hamilton’s The Star Kings (1947), James Gunn and Jack Williamson’s Star Bridge (1955), and Alfred Bester’s The Stars My Destination (1956). Canopus has also been mentioned in the television series Star Trek, The Time Tunnel and the games BattleTech, Frontier: Elite II, and Frontier: First Encounters. Canopus is one of the stars appearing on the flag of Brazil. The star symbolises the state of Goiás.